Haynie is one of the Tri-Towers Residence Halls, along with Wilkins and Wright. 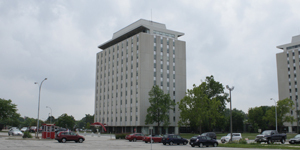 The Tri-Towers are adjacent to Illinois State’s Redbird Arena and Hancock Stadium, and are also a short walk to Milner Library and Schroeder Hall via the Main Street underpass. Haynie Hall was named after Martha D. L. Haynie and opened in 1964. Haynie was the first Illinois State Normal University (ISNU) female professor and a women’s counselor from 1866-1886. She taught English and French at ISNU and served as the Assistant Principal of University High School.